A plunger is a plunger is a plunger. Right? Well, no. In fact, there are different types of plungers, each with its own special purpose and technique. Stopped-up drain? Overflowing toilet? For these and many more plumbing repairs, homeowners reach for the plunger—a trusty, no-nonsense tool that often goes ignored. What you may not have known is that there are two types of plungers—the cup type and the flange type. Cup-type plungers feature a wooden handle with a rubber bell at the end. These are great for clearing clogs in sink and bathtub drains. 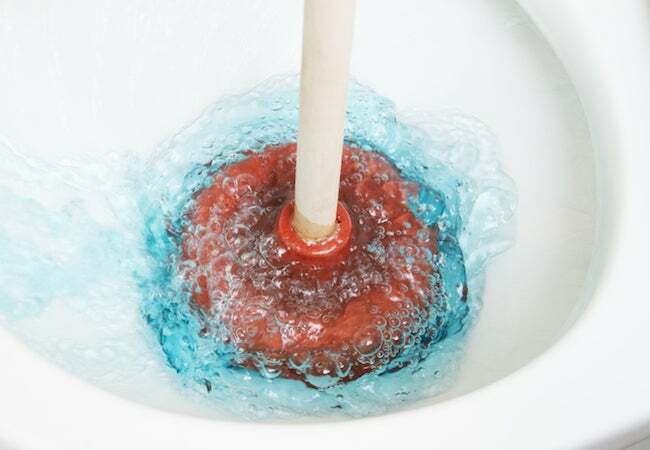 For best results, cover the overflow drain with a wet towel and, with a bit of petroleum jelly applied to the rim of the plunger, position the tool over the drain, pushing down to gain suction. Next, plunge the drain with quick thrusts for about 30 seconds. That ought to do it. For clogged toilets in particular, you need a flange plunger—a type that includes an extra ring of rubber to create an airtight, suction-enhancing seal. To use a flange plunger effectively, first shut off the water supply hose behind the toilet. Then submerge the plunger until the rubber ring meets the drain opening. Finally, finish the job by rapidly pushing and pulling the plunger up and down. No luck with the plunger? You may need a drain snake. Or, if you’d rather not deal with what can be a very messy job, you may want to call a plumber.